Project ONE Life: Just the Beginning! 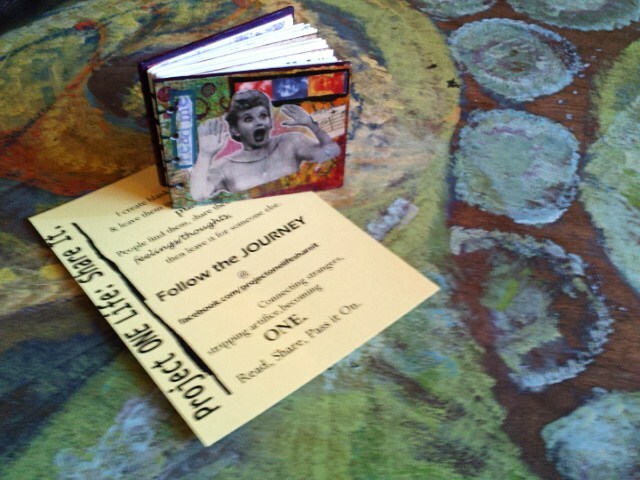 Project ONE Life is picking up steam and leaving books along the way. The journey is just beginning and we have a long way to go but so far, it as been a blast. Each book is left in a public place and has a theme. I get a small rush of placing down a book and taking pictures, unnoticed. And when I walk away, I wonder.... where will this book end up, who will read my writing, and will I see it again. I feel anxious, giddy, and optimistic. So far, seven books have made it out into the world and with many more to come. Plans are in the works to go national as well. So... keep your eyes open and follow the journey on facebook so YOU can track down one of these one of a kind books! Today I dropped the first Project ONE Life journal off into the world. 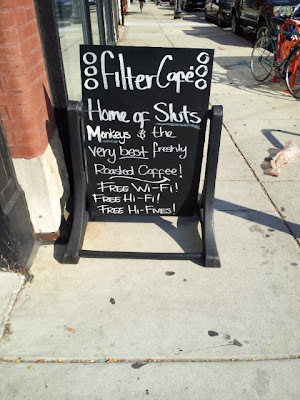 When I last saw it, it was sitting in a packed cafe in Chicago (Filter Cafe). With Project ONE Life, I am asking others to open up and share. I wouldn't ask someone to do something I wouldn't do myself. So in keeping with the idea of Read, Share, Pass it On, I wrote the first entry in the book. 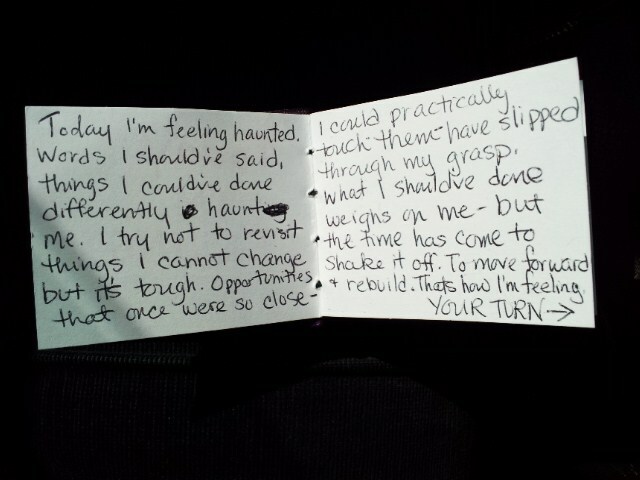 I placed it down, snapped a few pictures, and walked away - leaving a piece of myself for anyone to view. I wondered if I would ever see it again. I am a journal maker and believer in the healing power of words so it seemed like a natural progression to extend what I do in my everyday journal to the rest of the world. Each book is special and made 100% with LOVE. From cutting each sheet of paper and book board, stitching the pages together, and creating a mixed media collage cover, I put every ounce of myself into each book. I do this all in the hope that this project will bring people together and create a safe place to express themselves. So this is the look at the first book... and if you see it out there, put your stamp on it, take a pic, and leave it for another to find. Read, Share, Pass It On. Here's how Project ONE Life works! It's annonymous - be open, share! Take a pic of the book in it's location and post on facebook so we can follow it's journey. Don't want to post with your name? Email me and I will post it without your info. Be RESPECTFUL & SINCERE: If you find a book but it's not for you please respect the value/worth of others words and feelings and leave it as you found it so that someone else may have the opportunity to participate. If you do participate, please make a sincere entry. Do no disrespect the nature/intention of this book by making a mockery of it. PASS IT ON: Write in it, then leave it in a indoor (it's paper and needs to be protected from the elements) public place, preferrably a place you think people will be receptive to this project. DON'T KEEP IT! Yes, it would be a cool thing for your collection but that goes against the very reason for the book! LAST PERSON to write in it? Drop it in the mail or Contact me! It's on you I pin most of my faith... Please RETURN this traveling book of honesty, love, inspiration, and courage HOME so I can share all the entries and truly share and connect others! Project ONE LIFE: Share It. The idea behind Project ONE Life: Share It is simple. I create blank books each with a varying theme such as "a dream you want to achieve" and I leave them in various public places throughout Chicago. Then, the book lies in wait for someone to find it, and respond annonymously to the prompt. After doing so that person leaves the book in another spot for someone else to find it and the cycle repeats until the book is filled. The process is: find it, read it, share in it, and pass it on. I also ask people who find the book (regardless if they write in it or not) to take a quick pic of it in it's location and post it to facebook or email it to me so that we can follow it's journey. Once a book is complete, the finder contacts me so it can be returned home and I can share the contents with the world. Click here for the Guidelines. The Inspiration behind Project ONE Life: Share It. is based upon the belief that there is power in putting your feelings/thoughts down on paper and a belief that it is our feelings that bind us together as human beings. In sharing our ideas, loves, joy, and sorrows we become connected on a larger scale - you are not alone. Project ONE Life strives to connect strangers together on a small, local scale. As books travel through the city and people share a piece of themselves for others to see, we are reminded that the strangers you pass on the street, the person who makes your coffee, the person waiting behind you in line, are just like us. The feelings and thoughts we experience on a daily basis are universal. So this project attempts to expose those similiarities. To pull back the cleverly crafted barriers that often serve to isolate us from one another (cell phones, emails, false pleasantries, social media, etc). The goal is to strip away artifice, to be open, to share, to feel connected. To be ONE. Lastly, this project requires a leap of faith. Faith that people WILL share, will want to connect and most importantly that these mini books WILL find their way back home. Follow the Journey on Facebook!